"To provide young people with quality seamanship training for development of their abilities and potential. To help young people develop skills in group dynamics necessary for operation of a ship which are applicable to other situations in life. To educate young people and develop their skills, which will increase self-confidence and self-esteem. To provide support for youth interested in pursuing careers in the merchant marine, Coast Guard and/or the U.S. Navy." Each year from April through October young people from throughout the United States participate in this educational program. Since 1946 over 12,000 young people have boarded the ships and learned seamanship and personal development skills. This 40 member all volunteer organization is composed largely of retired Navy, Coast Guard, Merchant Mariners and other volunteers. These volunteers give approximately 4,000 hours each year to MANATRA. Our organization's function is not to train young people for a military career, or even for a career at sea, nevertheless some MANATRA participants have gone on to sea careers. Our true goal is to teach skills, leadership, self-reliance, and responsibility, and to expose young people to new experiences. Many young people coming aboard, including some of the NROTC candidates, have never been aboard a vessel of any size, and certainly not a vessel designed to look and operate like a Navy ship. Learning how to work and learn safely aboard, and how to be responsible for your actions is what MANATRA is all about. If we can help young people translate these skills to daily life, the real goals of MANATRA have been met. or just would like to learn and help out, find out how you can join our group. Military experience is not required. 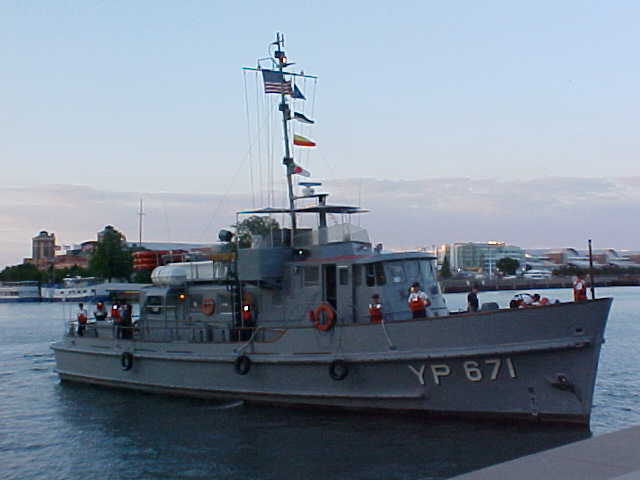 The Association's flagship, YP-671, is a yard patrol vessel of the U.S. Navy and is docked at DuSable Harbor in Chicago. Her primary function is the support of the Naval Sea Cadet Corps . We operate in cooperation with the Navy League of the United States, a civilian patriotic organization in support of the Navy, Coast Guard and Merchant Marine. as well as an orientation toThe United States Merchant Marine. About Us - Association History – Over 50 Years of Manatra! How You Can Help or Become A Part of the Action! - check it out! Ships’ StoreDo Your Shopping Here! The Marine Navigation & Training Association, Inc.
Want to join the NAVetsUSA-RING? This NavRing site is owned by MANATRA .